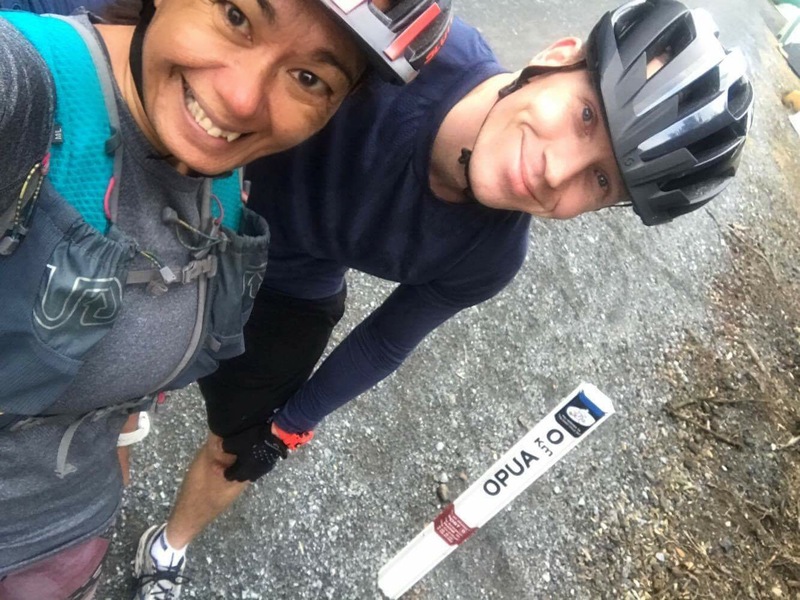 After J and I decided to ride the Twin Coast Trail, a 87km journey from Opua on the east coast of New Zealand through to the mouth of the Hokianga Harbour on the West, the first thing we did we looked at was the logistics. I prefer that we do our adventuring relatively self supported, that way we can move at our own pace (or more accurately mine, as I’m the slowest). Our plan (in the loosest sense of the word) was to find some accommodation near the half way point of the trail and then head towards the east coast on one day and the west the next. 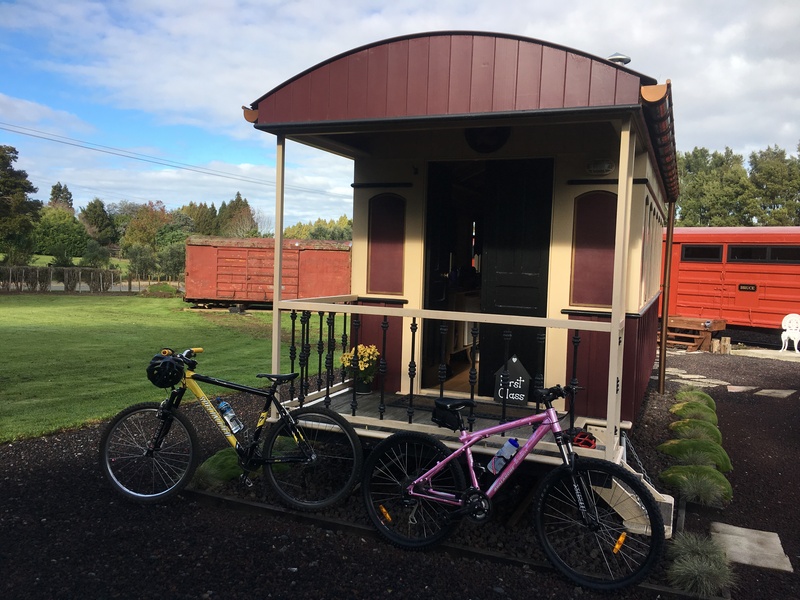 Running/riding self supported would usually mean that James and I would have to do an out and back trip, this time however, when I booked into the Okaihau Railstay our host Noelene mentioned that, for a small fee she could organise to pick us up at the end of each day (how convenient)! We drove up from Auckland early on a Friday morning and after meeting Noelene and being shown around the facilities we hit the trail (which is literally straight across the road). I thought we should go to Horeke because the weather forecast wasn’t looking very promising for the next day and after riding across the boardwalk on the Waikato River Trail I wasn’t keen on riding the boardwalk in Horeke if it was wet, but (thankfully) Noelene talked us into riding to Opua on our initial day on the trail. Although the trail runs east and west directly across the road from the Railstay (it’s just the footpath until you pass through the town) and there are 1km marker signs along the entire length of the trail, directional signage could definitely be improved, especially whenever you come off the trail and back onto the road. In one instance en route to Opua the trail just seemed to stop dead at the entrance of a plantation forest. There wasn’t any signage to be seen in any direction. I couldn’t even find any tyre tracks to follow so I pretty much had to “follow my nose” and hope for the best, I figured if I didn’t come across a 1km marker I could backtrack and then follow my nose in another direction. 😉 (FYI if the signs are still non-existent when you get to this point, turn left (away from the forest) and then turn right when you get to the road. Ride towards the bridge and as you cross it, you should see a sign up ahead). The trip from Okaihau to Opua took us just under 6 hours which included a lunch stop on the side of the trail in Kaikohe, a bathroom break at the only toilet on the actual trail (there would be other toilets en route but those would be located in town centres and you’d have to come off the trial to get to those) and we stopped for refreshments and another pit stop in the award winning toilets in Kawakawa. One thing is for sure, 6 hours (and 60 odd kms) is a long time to be sitting on a bike, especially if you are not a cyclist, have not attempted any training to be a cyclist and perhaps more importantly aren’t wearing the fancy padded pants that cyclists have. In fact although we were both quite proud of the fact that we finished, neither of us were very keen to get back on the saddle the next day for the final 26km section between Okaihau and Horeke. I’m SO glad that we did the Okaihau to Horeke section on Day 2, I said to James that I would have felt really robbed if we’d cycled to Horeke on the first day and then had to cycle the 60km to Opua the next day of which only the very first and very last sections of trail have anything remotely interesting on them, in fact if you’re time poor I’d just skip every other section and just do Okaihau to Horeke, although if you’ve got kids in tow then Kawakawa to Opua would be the go, you could even catch the train through Kawakawa Town Centre – how cool would that be!